There were two Captain Motts from New Jersey in the Revolution. Two family traditions claim that "their" John Mott was at the Battle of Trenton. This paper examines the origins of those traditions and demonstrates that one was at Ticonderoga, the other at Trenton on Christmas, 1776. All my life I have heard the family legend of my ancestor, my Great, Great, Great Grandfather, John Mott, told by aunts and uncles. Setting out to document this legend provided me with, immediately, a serious stumbling block, namely that there appeared to be three John Mott's in the Revolution from the state of New Jersey. Two of them were Captains. They are claimed by distinct families in the D.A.R. Patriot Index, and based on certain genealogies of the families based on Bible records, it would appear that there were two distinct men named John Mott from New Jersey who served as Captains in the Revolution, although each family tradition claims the same patriot soldier. These two family traditions are put side by side below for examination. In blue is the the claim to the service record. In >red are some striking inaccuracies in the account of Kate Mott. The task at hand it to separate their identities and their roles in the Revolution. First, however, is the published record of John Mott that both families claim. David Hackett Fisher's new book (January, 2004, Oxford University Press) Washington's Crossing uses this page in his research. To see the page (and the footnote) where he recounts the Hessian home invasion click here. Given that the most complete published roster of officers from the New Jersey is Stryker's Official Register, published in 1872, both families turned to this work to claim their patriot ancestor. Mott, John. First Lieutenant, Captain Patterson's company, Third Battalion, First Establishment, February 9th, 1776; Captain, Third Battalion, Second Establishment, November 29th, 1776; retired September 26th, 1780; also Captain, militia (p85). Mott, John. Captain, First Regiment, Hunterdon; also Captain, Continental Army; guide to General Washington at the battle of Trenton. I would suggest that Styker may have been confused, assuming only one Captain John Mott. My family tradition: John Mott (1746 - 1823), son of Ebenezer, married third Naomi Daggett. Their eighth child was Mary Alma Mott Jones, the mother of Amanda Jones, who published the family tradition in the introduction to a book of hers published in 1910. Their son, my grandfather, John Mott, supposed himself to be a “Friend,” until about thirty years of age, although he had lost his “birth-right” by marrying out of the Society. It came about, however, that owing to this following circumstance, he became a fully accredited Revolutionary officer. One bitterly cold Sunday in December, 1776, John Mott was forced to defend his family (a wife and three children) from six marauding Hessian soldiers.They broke down the barricaded door with axes, but were without firearms, as was the case with my grandfather (unless, indeed, tongs and poker might be so classed).As a result three took to their heels, and the remaining three were cast out over the door-sill dead.One of the two little girls, hidden in the cellar, never forgot the tumult overhead – she living to be not much under a hundred. The following morning John Mott went to General Washington’s camp, near the Delaware, and received from Washington’s “own hand” a lieutenant’s commission, authorizing him to organize a company of recruits for the Continental Army. This he did at once, equipping them at his own expense; and thereafter spent all his possessions in the service of his country throughout five years and eight months, till conclusion of peace. Be it noted that his “saintly” mother, after having been taken by him through camp, humbly confessed that the “carnal heart took pride and rejoiced in the protection of a son who was tall and brave soldier.”The son would never apply for a pension, although forced to support his third family (a wife and eight children, of whom my mother was the youngest) by learning and practicing the tailor’s trade – nor yet in a beggarly way, for he had apprentices. Hale and unbowed at seventy-seven, he died, as did Washington, of quinsy and mismanagement.Shortly before his death his sons and others saw him crossing the Mohawk river on the string-pieces of a very long bridge in the process of building, but none dared follow. By late advices from the War Department and from the New Jersey Adjutant-General, we learn that three men of the State, named John Mott, served in the War of the Revolution. The account given from both sources, of one of these three tallies with our family traditions so far as they extend. My mother stated from remembrance of his conversation, that although persistently calling himself a Quaker, he had felt that when necessity should arise he must be ready to join in the defense of the State.This may account for the earlier lieutenancy; but if we have him rightly located, his term of army service, whether as Captain, private or secret and trusted agent, was exactly five years and eight months from the date of re-organization for active warfare.He was therefore one of the Continental Army, until the news arrived of the signing, at Paris, of the Treaty of Peace, when forces were mustered out. “My own father has often told me about his terrible encounter with the six Hessian soldiers, and his going to Washington’s camp and accepting an appointment under him as lieutenant and afterward being engaged in the battles of Brandywine and Germantown. Your mother, when I visited her forty years ago (in 1867) told me many additional facts of great interest about grandfather Mott. Detailed genealogy of the descent of Gershom Mott (d 1733), John Mott's Grandfather based. In the official records of the local military organizations of New Jersey John Mott is named on 9th February, 1776, as First Lieutenant in Captain Patterson’s Company in the Third Battalion (Stryker’s Officers and Men of New Jersey in the Revolutionary War), but it does not appear whether this was his first or second or third term of service.A little before this, on the 8th of December, 1775, the First and Second New Jersey Battalions had been ordered to New York. On the 3rd of May the Second and Third Battalions went up the Hudson in sloops, and thence to Ticonderoga as reinforcements of General Sullivan, who, after the retreat of the British from Boston on the 17th of March, 1776, had taken command of the army which had retreated from Quebec. As Lieutenant John Mott was in the Third Battalion he was probably in this expedition. The New Jersey battalions were successively in Johnstown, German Flats, Fort Schuyler, Fort Dayton, and Ticonderoga and Fort Independence.They were chiefly engaged in preventing Indian incursions. But they all returned in time to take part in the campaign in New Jersey in the autumn and winter of 1776-77 (See below). But meantime a new army was being organized. New recruits were brought in, enlistments were made for longer terms or “for the war” instead of for the previous short dated, and Congress on the 12th of December gave Washington full power relative to the army. Lieutenant Mott and his comrades under Sullivan had just return from Ticonderoga.In the new organization of the New Jersey troops, John Mott was made captain of the Fifth Company in the Third Battalion (19th November 1776), and now the four New Jersey battalions constituted the “New Jersey Line” or Maxwell’s Brigade. But here, near his old home, Captain Mott’s local knowledge made him of great service as Washington’s guide, in planning and conducting a new attack upon the British in Trenton. Other farmers of the neighborhood were also called in. On the 20th of December General Sullivan arrived with troops from near Morristown.On the 25th, in the night, General Washington recrossed the Delaware and marched on Trenton,.Captain Mott in the darkness of the morning carried a fusee on his shoulder to light General Washington. The weather was stormy, and after they had marched about three miles the Captain said to General Sullivan that the priming powder in the muskets was becoming damp.. Sullivan replied: "Well, boys, we must fight them with the bayonet." When Washington heard this he said: "Tell tem to use the bayonet, and to penetrate the town, for the town must be taken! I am resolved to take it!" As is well known he took the town and captured a thousand Hessian prisoners. Captain John Mott can be traced during the remainder of the war in the “New Jersey Line” or Maxwell’s Brigade. On the 11th of September, 1777, they opened the battle of Brandywine and afterward encamped near Germantown and formed the reserve corps and left wing at the battle of Germantown…. As to the whereabouts of the Third Battalion , and it's Lieutenant Mott of the New Jersey Line during the Battle of Trenton, we can turn to four sources, the muster roll of the Third Battalion, Stryker, The US Army's Lineage Series, and the Diary of Ebenezer Elmer. 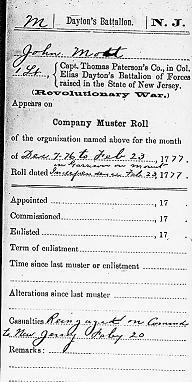 I have a copy of the muster roll, which, hopefully, I can reproduce here at some point. The second is the aforementioned Stryker's Official Register when he examines the Establishments of the New Jersey Line. This record is quoted by Ms. Kate Mott, but she evidently overlooks the passage that the Third Battalion did not leave Albany until March 7th, 1777 when she states "But they all returned in time to take part in the campaign in New Jersey in the autumn and winter of 1776-77." Authorized 10 January 1776 in the Continental Army as the 3d New Jersey Regiment and assigned to the New York (subsequently Middle) Department. Organized 7 February-18 May 1776 at Elizabethtown, to consist of eight companies. Relieved 14 March 1776 from the Middle Department and assigned to the Main Army. Assigned 24 April 1776 to Stirling's Brigade, an element of the Main Army. Relieved 27 April 1776 from Stirling's Brigade and assigned to the Northern Department. Relieved 1 March 1777 from the Northern Department and assigned to the Main Army. Assigned 22 May 1777 to the New Jersey Brigade, an element of the Main Army. Reorganized 7 February 1779 to consist of nine companies. Disbanded I January 1781 at Pompton. Thursday, January 23rd, 1777, .....The above was verified, for about 10 o'clock Lt. Mott and Ensign Stout, the effectives of Capt. Patterson's Company, came down with orders from Major Barber to take post on board...."
Also another reference to Lt. Mott in February. "Wednesday. 6. [November]. Mounted the Main-Guard in Montcalm's fortress.Lieut. Mott & Ensn. Kinney Subalterns. Col Roberts Field officer of the day. Nothing Material. Sett up all Night." There are, then, accounts that put Captain Mott at the Battle of Trenton. This letter refers to Capt Mott being sent over to the New Jersey shore to scout. There is no mention of a first name. The legendary "We must fight them with our Bayonets!" For an excellent online account of the Battle of Trenton that draws heavily from Stryker's book, see the history that has been published online by the Old Mill Society at The Two Battles of Trenton. This chapter in the 1929 History of Trenton by various authors, mentions Captain Mott as having informed General Sullivan that the priming powder was getting wet, leading to General Sullivan's somewhat legendary declaration that "we must fight them with the bayonet." (Source was no doubt Sryker...see above quote from page 140 of The Battles of Trenton and Princeton. In conclusion it would seem that a number of hypothesis could be invented to explain who was who and where during the Battle of Trenton. But until careful examination of the Compiled Service Records, muster rolls and payrolls can be examined, they would only remain hypothesis. Even then, one may never learn the truth. There is confusion generated by the family genealogists and the "official registrars". Even at the time, the guy who was marching next to "Captain Mott" on that cold Christmas Day north of Trenton in 1776 probably didn't know who his companion's father or wife was. My thanks to the David Library of the American Revolution for help in locating John Mott in Ticonderoga. I just wish I lived nearer that library!